← Where is Appendix A??? Meet-up At The Coverlet Museum! 28 May 2011. I drove to Bedford, PA again Wednesday night for our meet-up on Thursday. It was a beautiful Spring day in Pennsylvania, and Bedford looked beautiful. We didn’t meet at the museum until noon, so I grabbed some coffee (at He-Brews!) and headed South out of town. It was so much quieter than where I live. I’m from Collegeville, PA in the South Eastern part of the state. During rush hour you can hear a constant “roar” in the distance from the millions of car tires rubbing down the highways to and from work. But, just outside of Bedford, you don’t hear any roar. It was very peaceful and still. Something I long for these days. Beautiful surroundings set the stage for beautiful weavings. I arrived at the museum just before noon and met with our friends from Weavolution.com. They were already in the gift shop talking with the Zongers when I walked in. I met Alice Schlein and her husband Bruce. Claudia was there, the owner of Weavolution.com. I also met Karen, who loves to knit and was new to weaving. And I also met Lavern who has a very interesting background, teaches backstrap weaving, and is currently living in Bolivia. You can see a photo of us on the homepage of weavolution.com. Since I had been there this past February, the museum had changed. 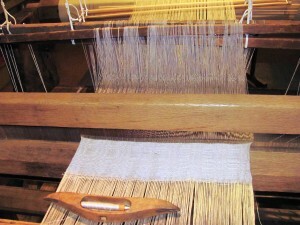 There were new coverlets being displayed, the restored Jacquard “head” had arrived, and the “Loom Room” was open for display. The Jacquard head was not yet attached to the large barn loom, but we could get a very close look at the mechanism. It’s just amazing to think of the impact this little box had on civilization. 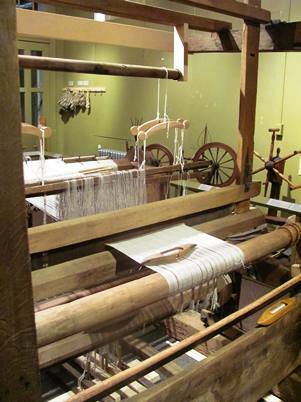 One of the more fascinating aspects of the museum is Mr. Zonger telling the tale of the history of the Jacquard loom in France. We all had a great lunch together at the “Bad Boys” restaurant in Bedford, and then Melinda Zonger gave us the grand tour of the museum. She also talked about the history of the coverlets and of how the museum is open to donations of authentic coverlets. Melinda also told us that the old school house they had purchased for the museum was worse off than they first thought. The school needs a new roof! Just examining the roof ruins more shingles as the workmen walk on it, she explained. Being much larger than most houses, the new roof will cost about $80,000.00! I propose we have a “WEAVE-IN” to help raise money for the museum! We could get sponsors just like the sponsors in a walk-a-thon to sponsor weavers to set up shop outside the museum and weave for a day. 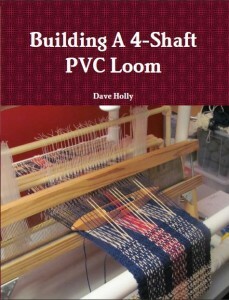 The weavings produced would also be sold to help raise money. And, the sponsors could pledge an amount for each hour of weaving that a weaver could weave. (Sounds like wood chucks! ) It would at least be a start to help save the museum. We’ll discuss it over at weavolution.com. I wonder what I will find the next time I visit the museum? Almost forgot! While driving home from the museum, I traveled North past Altoona and stopped in Tipton, PA to visit my Grandmother’s grave. I then went East to Bellefonte and then traveled down Rt. 322 towards Harrisburg. It was close to 7:30 PM when it started raining – hard! The further down 322 I went, the harder it rained. I got 12 miles from Harrisburg when the rain got crazy. I said, “Holy S$%^”, out loud – twice! Right then, the traffic came to a stop. It didn’t move. But, I was right at the exit for Rt. 225. I took that to see if I could find another way around Harrisburg, but there were trees down everywhere. 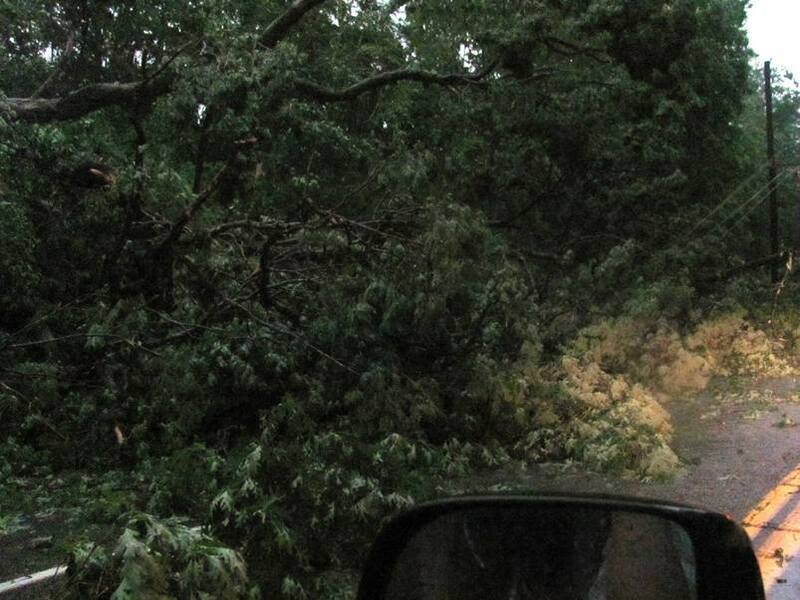 I must have seen over a dozen very large trees blown over by the near-hurricane winds that swept through the area. Here is a photo I took of one. Click for a larger view. I couldn’t get a better shot of the rest of the tree across the road. 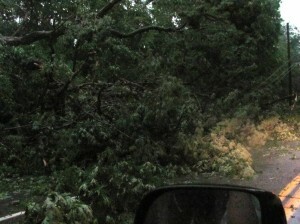 I had to drive through this tree as did the 2 cars in front of me. It was like going through a car wash as the branches scrapped the top of my truck. I couldn’t find a way East. I tried Rt. 325 and got about 20 minutes down the road when I was flagged down by an approaching car. The driver told me of another huge tree that completely blocked the road and killed the power lines. So, I turned all the way around and found myself back on Rt. 322, stopped dead. I played solitaire on my laptop for about 45 minutes. Towards the end we saw a huge front-end loader pass us, which was able to remove the giant tree blocking both lanes of 322. Things started moving again and I was finally able to continue back home.